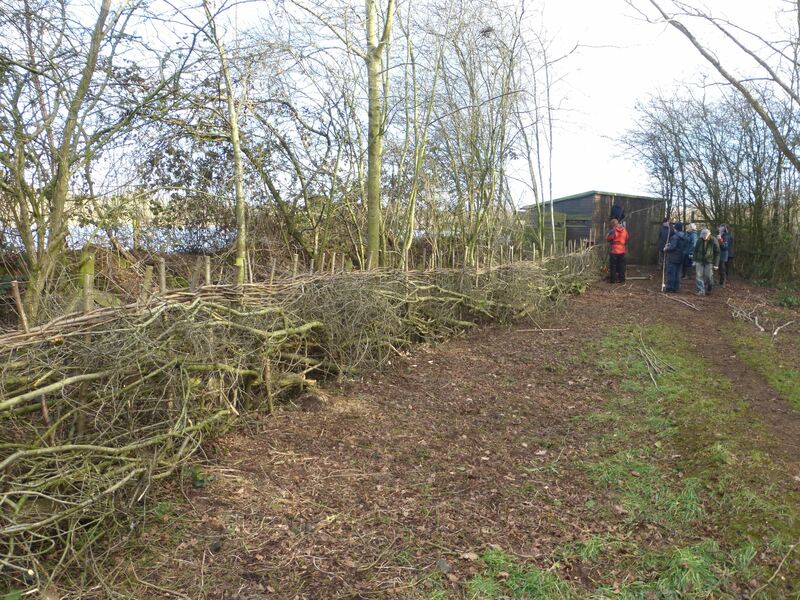 At Moor Green Lakes the last remaining section of hedge to Coleford Hide has been laid by the volunteers. Hawthorn forms the majority of the line of trees that were planted to form a screen on the approach to the bird hide. These trees as they matured developed several gaps underneath, reducing the screen but making them ideal for hedge-laying. Firstly the hedge was thinned of the awkward branches with a chainsaw, reducing the volume by around 2/3, with the brash recycled as a dead hedge by the bird feeders. Volunteers then set to work splitting the stems so they could be folded over and laid to form pleachers. 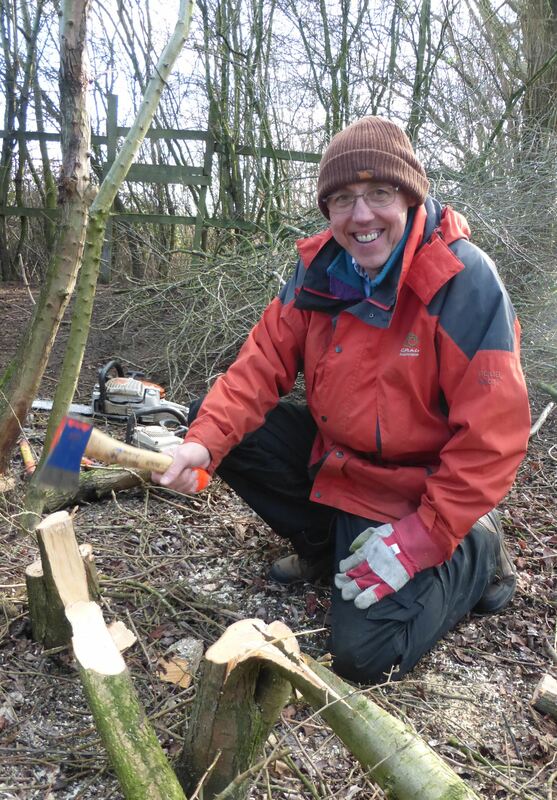 Alan H discovered the delicate art of laying and keeping the pleacher attached to the stump so it will regrow in the laid hedge. The 60 hazel stakes and binders used for support and to weave along the top for structure, were all harvested the week before on site. The hedge will be trimmed for a couple of years to encourage dense lower growth, then allowed to grow up into a natural screen. This is far better than a fence since it also provides foraging and breeding niches, like the bird nest we found in the hedge we laid last year. 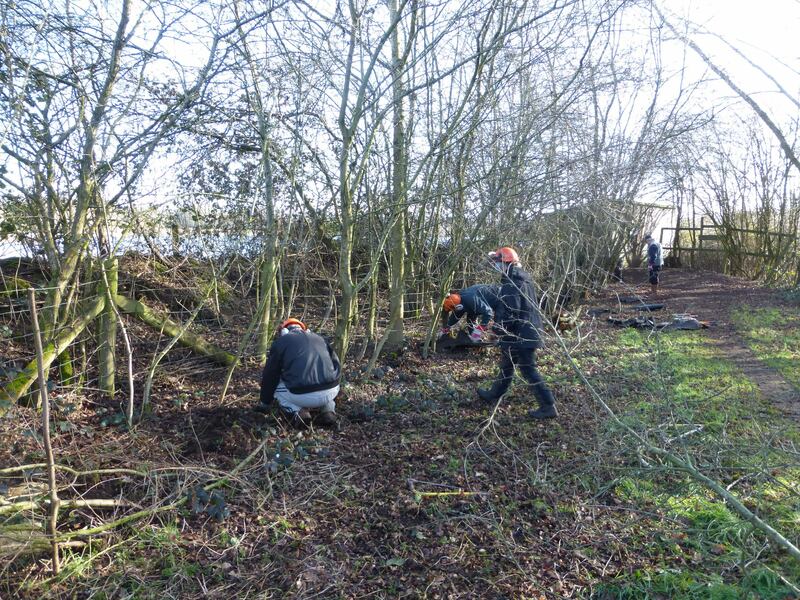 This remaining section of hedge proved more awkward as there were lots of multi-stem wiggly trees which tested our hedge-laying skills, but it was great to teach so many new volunteers and provide a show case for their work. 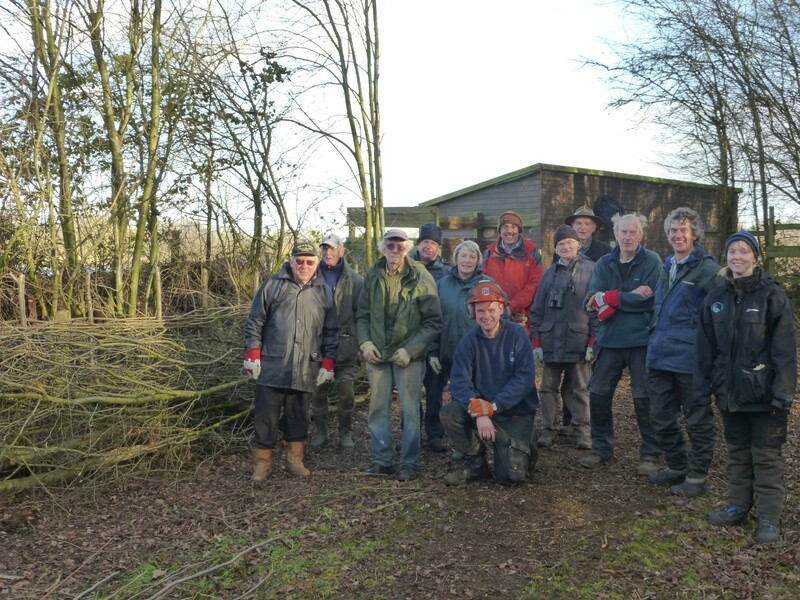 This entry was posted in Conservation, Moor Green Lakes, Volunteers and tagged hedge laying, Moor Green Lakes, Volunteers. Bookmark the permalink.